This solid wood Modesto Mission Bed is Amish made in Indiana from Oak Wood, Brown Maple Wood, Cherry Wood or Quarter Sawn White Oak Wood. 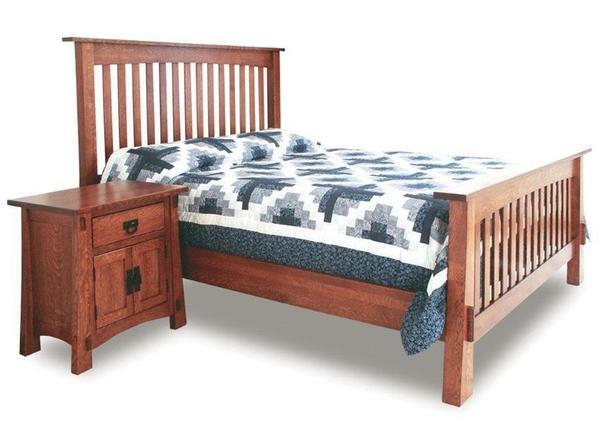 This Amish Bed has flared legs, and exposed tenons that complete the beautiful Mission look. The headboard and footboard have traditional slats that evoke a feeling of Mission craftsmanship. The Modesto Mission Collection evokes a feeling of the Old West with its beautiful flared legs and exposed tenons. We offer a wide variety of Mission furniture and Mission style beds please call for assistance with locating the perfect one. Floor to Bottom: 8 1/2"
Words cannot describe how pleased we are with our DutchCrafters order! Each piece is beautiful! With 2 beautiful new desks, my husband even likes being in his home office now. Unfortunately, there is a rail missing from one of the file drawers. Who do we contact to get one?